Join Bee Balanced Therapies team members Janice Ingson, Steven Bumbry and Elizabeth Scollan for 5 days of respite in a space with the awe-inspiring backyard of Joshua Tree National Park. We will be staying at Cactus Moon Retreat; a private oasis set on two and a half acres of high desert bliss, surrounded by a desert oak, piñon, and juniper-studded landscape. Wake up at your leisure, and sip a chamomile tea while taking in the sights and smells of our surroundings. Then, join us in the property’s private yoga studio for a variety of movement, self-care and meditation offerings from three distinctive and skilled teachers. Each day is yours to explore Black Rock Canyon at Joshua Tree, peruse the Hi-Desert Nature Museum in Yucca Valley, relax in a hammock near the private pool with the book you’ve been dying to finish or you can simply take a nap! Each night, we will offer an evening practice that will prepare you for a restful night of sleep. Space is limited, and all sleeping space is shared, so if you're interested, consider grabbing a friend and bringing them along too! *Twice daily yoga, meditation, and/or self care practices. Full balance due by 4/14/19. Fascia is a connective tissue that is like the fabric of our body. It gives our body structural shape and surrounds every muscle, organ and bone. Myofascial Release (MFR) creates movement along myofascial lines, or pathways of connective tissue that become contracted and adhered from habitual movement and chronic posture positions. This technique will relax muscles, improve blood flow and increase lymphatic circulation. In this workshop, you will learn tools to unravel tension in your tissues This will prepare you for the deeper surrender that you get from the Restorative Yoga portion of class. You will take home simple, yet effective, knowledge that you can apply in your own self-care routine. as well. You will also leave with an increased sense of overall well-being. Steven Bumbry: Part-time Gilbert, AZ resident and student at Gilbert Yoga. Steven is a former Baltimore Oriole turned yoga teacher, massage therapist and entrepreneur. He is deeply passionate about sharing his experiences and formal training to help clients reach optimal health through balanced living. Join Janice Ingson and Steven Bumbry for this incredibly healing and educational practice. In this workshop, you will learn take-home techniques to unravel tension in your tissues This will prepare you for the deeper surrender that you get from the Restorative Yoga portion of class. You will take home simple but effective knowledge that you can apply in your own self-care routine, as well as increased feelings of overall well-being. Myofascial Release (MFR) creates movement along myofascial lines, or pathways of connective tissue that become contracted and adhered from habitual movement and chronic posture positions. This technique will relax muscles, improve blood flow and increase lymphatic circulation. Join us on Saturday, October 27th from 5PM to 7PM for this exciting, multi-disciplined workshop co-led by Janice Ingson and our own Steven Bumbry! FLOW: Janice will guide you through a breath-centered 30-minute Gentle Flow. 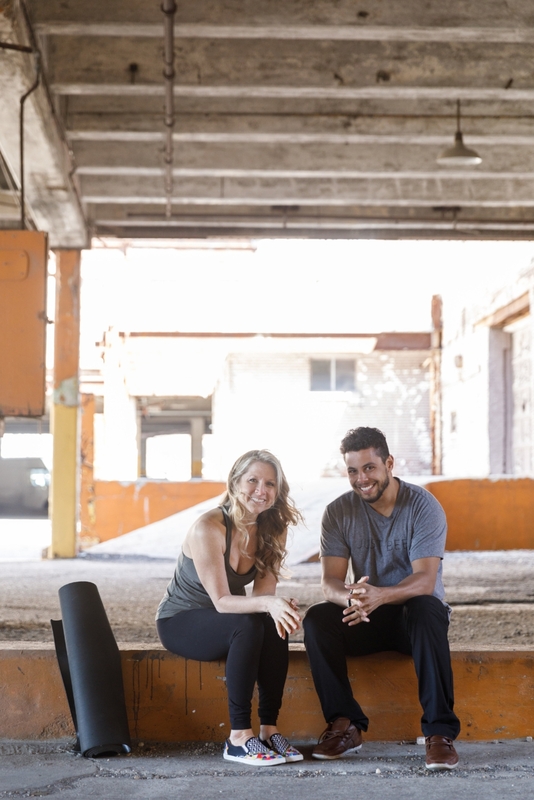 RESTORE: Janice AND Steven will co-teach 30 minutes of Restorative Yoga postures that will take you into deep stillness. THAI YOGA: Steve will introduce you to several Thai Yoga Massage techniques for you to take home to friends, family, and loved ones. Janice Ingson and Tiffany Haddad will offer our second annual weekend getaway in Western Maryland, planned solely for women! We will gather in community to support each other in self-care and simple enjoyment. Contact Janice Ingson Yoga directly for more information. Join us on Saturday, July 28th from 5PM to 7PM for this exciting, multi-disciplined workshop co-led by Janice Ingson and our own Steven Bumbry! We have so much fun every time we get together that we’ve decided to do it again this summer! Join Kevin Paris, Janice Ingson and Steven Bumbry for another awesome evening of yoga with live music! This Flow & Restore class is 45 minutes of continous movement linked with the breath, creating a fluid sequence that gently challenges the body and assists in stilling the mind. The flow is followed by 45 minutes of restorative poses, including deep breathing techniques and meditation, allowing practitioners space to enjoy the stillness. And, as if that wasn’t enticing enough, all of this will accompanied by the sweet sounds of Kevin Paris. If you haven’t heard him live, you won’t want to miss this. and insightful yoga teacher. She believes in giving her students the space and time to enjoy their own journey within. Steven is a retired Baltimore Oriole who sought Restorative Yoga for its physical and mental benefits after several traumatic injuries. He is passionate about leading students into a journey of healing through breath work and postures accessible to everyone. 2018 Yoga with Goats - Maryland - Ongoing classes! Check out the Facebook page for the class schedule as it is announced! Join Janice Ingson and Steven Bumbry as they collaborate to offer an incredible gift of breath and relaxation to you! This event starts with a 60-minute Gentle Flow & Restore yoga class, and is followed by a long savasana enhanced with Thai yoga massage! This practice will be a very gentle yoga flow sequence, followed by some restorative poses to settle deeper into the breath and into stillness. During an extended savasana, students will receive some basic thai yoga massage techniques to assist into an even deeper state of relaxation.Traditional Thai Yoga Massage is an ancient healing system that combines broad and targeted acupressure, stimulation and manipulation of soft tissue and energy lines while being assisted into yoga postures – all while you are fully relaxed and breathing deeply. in order to clear energy blockages and relieve tension.The overall effect of this class is connection to breath, deep relaxation, rejuvenation, and physical and mental well being!The energy Janice and Steven share is uplifting and inspiring. Students will leave this class feeling both light and energized. It will be a special treat to end the week and a beautiful way to move into the weekend! Join Janice Ingson and Molly Dearstine as they collaborate to offer an incredible gift of healing to you! This event starts with a 75-minute Warm Flow & Restore yoga class, and is followed by a long savasana enhanced by acupuncture! What a beautiful way to release the built up stress we often feel leading up to the long winter holidays! It’s really quite a lovely healing practice, and Janice is turning up the heat and focusing on hips and twists in the Flow portion of the practice, helping you to work out some of the cold weather, holiday stress (and edible treats) that tend to sneak up on even the most mindful of us! The room will remain warm and cozy for the Restore portion, encouraging you to soften and allow the props to support you. The icing on top is that Molly will offer acupuncture in specific points (ear and third eye) that will help you to relax more fully into savasana. With Janice Ingson and Laura Solomon. Hosted at Main Street Yoga in Ellicott City, Maryland. Please join Janice Ingson and Laura Solomon for an inspirational blend of vinyasa and restorative practice, writing with a series of guided poetry prompts, and sharing of our writing and wisdom. The yoga practice for this class has been created to help balance the second chakra, swadisthana chakra, where, energetically, our creativity resides. We will focus mainly on hip opening poses during this practice, in an effort to free creative energy. The writing portion of our workshop will focus on a series of fun, simple prompts designed to help us unearth our inner selves. Everyone is a writer and will enjoy writing poetry with these fun prompts. Participants will come away from this workshop inspired physically, mentally, and spiritually with a deeper awareness of themselves and others. You've probably seen this on social media somewhere by this point, and now we've decided to bring it to you locally! Join us for yoga with goats on several dates throughout the summer! We will give you time to mingle with your new friends before we practice with local yoga teacher, Janice Ingson, and other guest teachers, then the goats will practice (or play) right alongside (or on top of) you. What an awesome experience, and we are excited to be offereing it to all you kids! Events sell out in less than a day usually, so stay tuned to the Facebook page, Yoga with Goats - Maryland! BOTH CLASSES SOLD OUT IN RECORD TIME! CLICK ON THE EVENTBRITE LINK AND ADD YOUR NAME TO THE WAITLIST, IN CASE WE ADD ADDITIONAL CLASSES BEFORE THE BABY GOATS MOVE AWAY TO OTHER FARMS! You've probably seen this on social media somewhere by this point, and now we've decided to bring it to you locally! Join us for yoga with goats on Sunday, May 21st at 10am and at 1:30pm! We will give you time to mingle with your new friends before we practice with local yoga teacher, Janice Ingson, then the goats will practice (or play) right alongside (or on top of) you. What an awesome experience, and we are excited to be offereing it to all you kids! THIS EVENT SOLD OUT, AND A SECOND CLASS WAS ADDED AT 1:30PM-3:30PM! Join Janice for a two special classes in the amazing shore town of Cape May! Join Janice for a lovely healing practice that includes a gentle vinyasa practice (Flow), as an opportunity to more deeply connect to the rhythm of your breath. Poses will focus on shoulder opening, heart opening, hips and twists… places where we humans generally carry tension. This will give you the opportunity to use your breath as a tool to relax and open throughout your body. After the flow, Janice offers a restorative sequence (Restore) that will encourage you to soften and allow the props to support you, while you allow your breath to nourish and heal your body and spirit. Deep connection to breath, release tension and stress, restoration and rejuvenation. You will move into your weekend with a sense of peace and lightness. This is a class unlike many others. You’ve been practicing yoga for awhile, you know it’s a powerful thing, and you want to know more! The purpose of this Immersion is to provide students with a firm foundation and a solid understanding of the principles and practices of yoga. This class serves those looking to explore the profound practices of yoga and offers something for all levels. This immersion is designed to take your personal yoga practice to the next level and to develop your understanding of the deeper concepts of yoga. The class will serve those looking to explore and weave the transformative practices of yoga and meditation into daily life in order to fully experience those concepts on a personal level. We will chant OM and discuss its power. We will provide an overview of yoga philosophy, with a brief synopsis of the Yoga Sutras. We will discuss chakras, bandhas and mudras. We will include practices of asana, pranayama and meditation. Join Janice Ingson and Molly Dearstine as they collaborate to offer an incredible gift of healing to you! This event starts with a 75-minute Flow & Restore yoga class, and is followed by a long savasana enhanced by acupuncture! What a beautiful way to release the built up stress we often feel just living in today's modern world! This class will be limited to 9 people, and the cost is $40. The recent offering was extremely well received, so we've decided to offer a single night of the same practice!! Janice will be leading a series of classes and private yoga sessions at Yoga House Mauritius November 5th-19th, 2017! Janice Ingson and Tiffany Haddad will offer a weekend getaway in Western Maryland solely for women! We will gather in community to support each other in self-care and simple enjoyment. Spirit Renewal and Soul Celebration!! of spirit renewal and soul celebration on the Eastern Shore! This nourishing and joyful weekend includes 3 days and 2 nights filled with Yoga (think - Sunrise Yoga, Yoga Flow, Therapeutic Yoga, Partner Yoga...), Meditation, Stand Up Paddle Boarding, fire pit rituals, journaling, a pool, 200 acres of bayside land, miles of walking paths, delicious food and wine (planned by the amazing Colin Bickley), AND... a 6 hole frisbee golf course ;-). Get ready for a 6-night yoga retreat at Xinalani Retreat Center with these two inspiring teachers! Janice and Dan are both vibrant and powerful teachers, and each brings a very different yoga background and practice to this premier yoga retreat/vacation. Janice will share her passion, Flow & Restore Yoga, while Dan, a Baptiste Certified Power Yoga teacher, will lead these signature power yoga classes. The combination of two very different, yet complementary, practices, rolled into one magical week in an idyllic setting is an opportunity of a lifetime and it could just be the missing ingredient to what you need to reignite your life! Join Janice Ingson and Dan Nevins for an unparalleled dive into a sea of inspiration, exploration and pure delight! This is a first of its kind event and will be a life-changing week for those who attend. It simply cannot be avoided. Xinalani (pronounced “she-nah-lah-nee”) Retreat is an eco-chic retreat center, with private. pristine sand beach, situated on 10 acres of splendid unspoiled jungle on the southern shore of Banderas Bay, only 12 miles south of Puerto Vallarta International Airport (PVR). and all transportation to and from the airport will be provided! Dan will lead you through a daily Baptiste Power Yoga class that will make you work, will make you sweat and will inspire you to make a positive difference in your life. Dan will bring fire, as he shares his love of yoga and his stories of all its done to heal him after sustaining a traumatic brain injury and losing both legs below the knee in combat. There’s a really good chance he will make you laugh too, but know, for sure, that his depth of experience will help to re-shape your perspective on what is truly important in this life. Janice will lead you through a daily practice of her signature Flow & Restore Yoga. This is a healing practice that begins with a flowing sequence that is guided toward connecting with the breath, rooting down to the earth and moving in ways that show us where we are holding on to tension and quite possibly restricting this amazing and healing breath flow. The second part of the practice is an invitation to stop doing and to start simply being. Fully supported restorative poses are offered, using lots of props. We will first get comfortable, then focus on breathing and letting go of thoughts and activity. This restorative practice allows the body to relax more fully to receive the nourishing and nurturing qualities of the breath. These two teachers, combined with the power you already have within you, , will get you refreshed and recharged for your return to your daily life! Enjoy magnificent ocean views and relax with the sound of the waves as the chefs serve us gourmet healthy meals, using locally grown produce and fresh fish and seafood. Other than our daily yoga and meditation offerings, the day will be yours to spend however you decide – relax on the private beach, take a swim in the ocean, snorkel, kayak, stand-up paddleboard.. you’ll have lots of choices and no requirements! What could be better? Space for this retreat is limited. REGISTER NOW, or you might miss out on this once-in-a-lifetime experience! A non-refundable deposit of $500 is needed to secure each spot. Half of the remaining balance will be due January 30th, 2016, and the remaining balance is due March 1st, 2016. Any rooms not paid in full by March 1st will be re-released for sale. We cannot compensate people for unforeseen circumstances (injury, family emergency, etc.) so, to be safe, we recommend purchasing travel insurance. Book by December 1st, 2015, and receive a $50 early bird discount off of advertised prices. GO RIGHT ON OVER TO EVENTBRITE TO REGISTER! PLEASE CONTACT JANICE@JANICEINGSONYOGA.COM FOR FURTHER INFORMATION. Please join me for a sweet morning of yoga at Discovery Farm, followed by a wonderful European-style brunch! Our lovely hostess, Kristin, has invited us to her peaceful historical farmette on Folly Quarter Road, where we will move through a sweet yoga flow. After the guided practice, Kristin will serve us a delightful array of farm fresh foods, a glass of wine and we will have a real conversation around happiness! The 1.5 acre pond on the property is swimmable. In fact, that water is supposedly more pure than the water from your faucet! If it's a hot morning, feel free to take a dip in the pond! This farm is wonderful, our hostess is a delight, and I feel so fortunate that we've been invited to use this space! This will be a magical morning of self-exploration and community, and I can hardly believe it's happening! Cost is $35 per person, plus any fees that Eventbrite charges for ticketing.